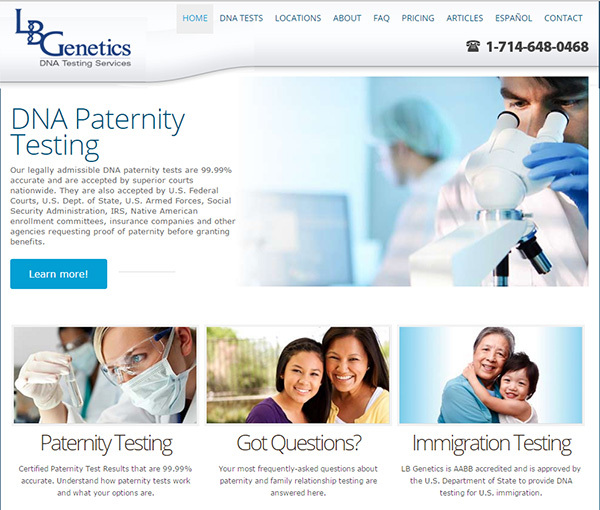 WIth its roots in DNA Paternity Testing, L B Genetics needed to expand its footprint dramatically with its recent accreditation by the department of Immigration and Homeland Security as an AABB-accredited provider of DNA testing services for immigration cases. WIth a large increase in the number of cases, the upgraded site was needed to take a lot of the mundane, day-to-day inquiry handling and processing away from support staff and make it available on the site, allowing staff to focus on the more critical aspects of test handling and analysis. This included frequently asked questions, pricing information, educational information, types of testing offered, maps and addresses of testing locations, directions to test facilities, nearest location lookup, online request handling, appointment setting and more. In addition search engine optimization continues to be an important aspect of LB genetics marketing startegy as most inquiries come from web searches. The site addresses all of these needs and more. It's new format makes updates and management more user-friendly and the custom database allows for easy updates to the 1,000 plus test facilities.